The multiple CNC package contains similar software modules to the single CNC package but with additional features designed to maximise the opportunities available in a multi machine situation. Therefore, it may be helpful to read the “MANUFACTURER WITH A CNC” outline first. If you have a manufacturing operation with multiple CNC’s then you must also have a substantial flow of work coming in or you wouldn’t be in that position. The next question is, how does your manufacturing capacity compare with your potential incoming work flow. Are you getting enough work to keep your factory busy? Or are you getting too much and can’t keep up? At QuickCAM we constantly hear from managers who have offers of more work but are afraid to take it on as they do not want to disappoint the customer. In most cases we can substantially improve the flow through the factory, making room for more producttion to be added. When there are multiple machines the improvement grows exponentially. Developed over the last three years QuickCAM Production is built on the most modern software platform and incorporates the most advanced features for this industry. 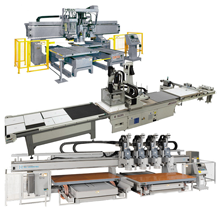 Typical brands: Accu-Systems, Anderson, AXYZ, Biesse, Busellato, CNT Motion, Cosmec, Gannomat, Giben, Heian, Holz-Her, Holzma, Homag, IMA, Koch, Komo, Masterwood, Morbidelli, MultiCAM, Northwood, Omal, Onsrud, Schelling, SCMI, Selco, Shop-bot, Shoda, Thermwood, Tiger Stop, Twin CAM, Weeke and others. QuickCAM Production will run to virtually any CNC machine including Beam Saws, Flatbeds, PTP, Dowel Inserters, Hinge Inserters, Horizontal borers etc. QuickCAM will create the machining program in a dedicated format for each machine in the factory. In the event where you need to change machines the process is simple and easy without having to re-run the program. A full range of optimisations plus the new SpeedCut, which can produce 17% to 30% more throughput on any machine.